London, Thursday 4th May: Mr Kulbhushan Jadhav (a 46 year old Indian national, married father of two and former Navy officer) was captured in Iran on a business trip to the country. It is believed he was targeted due to his past in the Navy and was most likely handed over to Pakistani authorities in exchange for a reward (a common practice in the region). 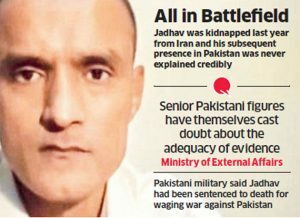 Mr Jadhav was accused of “espionage and sabotage activities against Pakistan” and held in custody before being tried through “Field General Court Martial under the Pakistan Army Act”. Mr Jadhav was denied any contact with his family, access to medical assessment or independent legal advice and the entire trial was held in Urdu, a language that Mr Jadhav does not speak. He was then awarded the death sentence based on, Pakistan’s own Foreign Minister has admitted, a lack of tangible evidence. It is highly likely that Mr Jadhav was tortured as part of his interrogation by the Pakistani intelligence agencies. The video released by those authorities (in which Mr Jadhav ‘confesses’ to espionage) clearly indicates a false confession under duress and the recording has been edited at least 127 times. We are unaware of Mr Jadhav’s current physical and mental state and there is a current popular movement to get the Pakistani authorities to not only produce Mr Kulbhushan Jadhav in public, but also to get him independent legal help, as well as getting him released back to his family. Justice Upheld’s Jas Uppal: “”Considering Pakistan has ratified key UN human rights treaty and Conventions, it is a travesty of justice that the Pakistani authorities blatantly continue to contravene and undermine the same with impunity by denying Mr Kulbhushan Jadhav his fundamental rights. It is clear from the failure of Government of Pakistan to cooperate and their failure to demonstrate transparency, that Mr Jadhav’s conviction of “espionage” is unsafe and should be subjected to rigorous legal scrutiny.